Bart Elsbach, co-owner with his wife, Janet (standing behind him), of the Great Barrington Fairgrounds explains plans for the fairgrounds' redevelopment to the Great Barrington Selectboard this week. Great Barrington – For a project that seemingly has the good will of the community behind it, the revival of the Great Barrington Fairgrounds has proven remarkably adept at confounding and frustrating town officials who would otherwise be inclined to support it. Since purchasing the 57-acre, derelict property on South Main Street along the Housatonic River for $800,000 last year with the goal of transforming the fairgrounds into a sustainable agriculture and recreation center, with educational programs focused on environmental preservation, Bart and Janet Elsbach of Sheffield have mustered an eager coalition of volunteers to clean up and clear out the overgrown race track, its grandstand and outbuildings, and have established a nonprofit organizational structure. And no doubt about it, the property looks better than it has in decades. And they’re off! Strolling the fairgrounds track during a recent Saturday morning Farmers Market. Photo by Scott Christianson. This season, the Great Barrington Farmers Market has relocated to the fairgrounds with great success, attracting more customers and vendors than it was able to accommodate at its former downtown site at the railroad station. “There are two to three times the number of people visiting the farmers market now than in the past, and the reason for it is that the community is asking town officials to make this happen,” farmers market director Howard Lefenfeld told the Selectboard this week. Great Barrington Farmers Market on opening day. But, perhaps because of the hybrid nature of the enterprise – a nonprofit, community redevelopment project, represented by the Elsbachs rather than an attorney or consultant – or perhaps because of the challenges of navigating regulatory requirements for property located within a floodplain, the Great Barrington Fair Ground (GBFG), as the project is formally called, has run afoul of the town’s permitting procedures. First, the Elsbachs got into a wrangle with the Conservation Commission over which part of the property they could situate a dog park and which part was considered a wetlands. That matter is still unresolved. Then, just this week, the Elsbachs came before the Selectboard with a special permit application to make a series of improvements, but the application lacked the required certification by a qualified engineer that the alterations to the property would comply with floodplain regulations. The permits to begin improvements are necessary, Bart Elsbach explained, in order to pursue the fundraising that will sustain the project financially. He also pointed out that solar array was intended to be a “financial engine” for the fairgrounds renovation, but that it needed to be approved by July. For more than two hours Monday evening, the Select Board struggled to accommodate the applicants, by dividing the application into two sections, a compromise suggested by Town Manager Jennifer Tabakin. And Tabakin pointed out that the solar array, for example, would need an engineer’s certification that it could withstand flooding, as required by law. 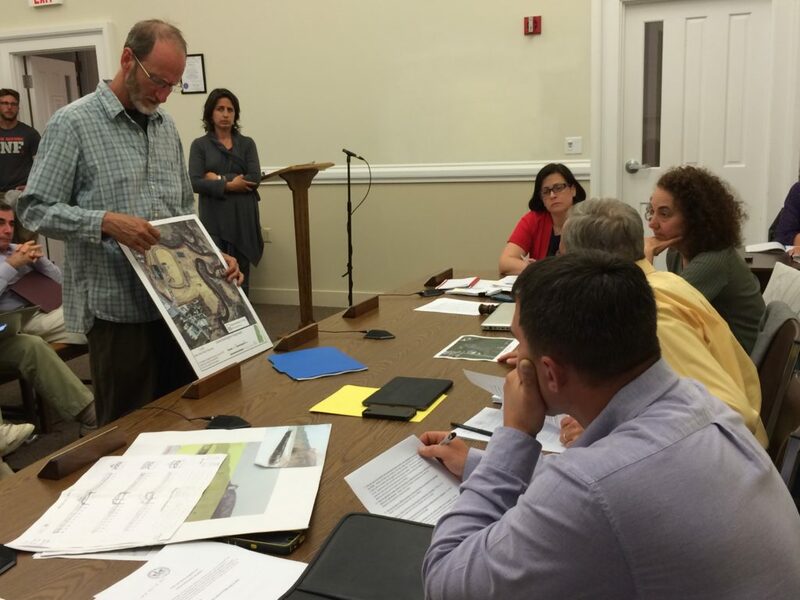 In the end, the Selectboard endorsed only the GBFG’s request to be designated a “community center,” the category within the town bylaws that most nearly describe the fairgrounds redevelopment. The Elsbachs will return for another hearing on their special permit application. “Our goal is to make this happen,” assured Selectboard Chair Deborah Phillips. The CBFG is an unconventional project, and undoubtedly this creates stumbling blocks in a system that has been set up to deal only with precedence. It would be a tragedy, however, if bureaucratic tangles were to derail this project, which will have a tremendously positive impact on our community, land, children, animals, and food supply systems. I personally would beg the selectboard to think outside the box in this instance and to streamline the process where possible for the Elsbachs, keeping in mind that CBFG is working on limited resources (it is not a corporation or well-endowed non-profit), as well as the fact that CBFG is an invaluable and probably one-time opportunity for the town. We do not want another Kmart in that space! Please do what you can to help make this happen! Very well said, Anni. It seems the town would welcome and applaud the commitment and courage it took for private citizens to undertake a project that suits the communities goals and engages a well thought-out strategy for turning a problem into a sustainable asset. We have the opportunity to model other community partnerships and to become a model for public/private collaborations.